Axtell, originally called Willow Creek, is a wide-spread, productive farming community located on the boundary of Sanpete and Sevier Counties. It is a living monument to the rugged characteristics of the pioneers who came to this valley. 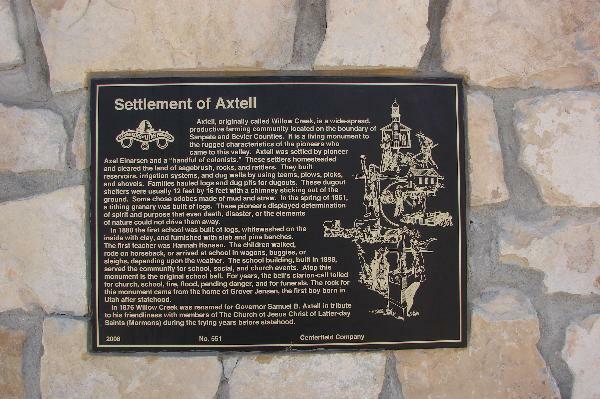 Axtell was settled by pioneer Axel Einarsen and a “handful of colonists”.” These settlers homesteaded and cleared the land of sagebrush, rocks, and rattlers. They built reservoirs, irrigation systems, and dug wells by using teams, plows, picks, and shovels. Families hauled logs and dug pits for dugouts. These dugout shelters were usually 12 feet by 16 feet with a chimney sticking out of the ground. Some chose adobes made of mud and straw. In the spring of 1861, a tithing granary was built of logs. These pioneers displayed determination of spirit and purpose that even death, disaster, or the elements of nature could not drive them away. In 1880 the first school was built of logs, whitewashed on the inside with clay, and furnished with slab and pine benches. The first teacher was Hannah Hansen. The children walked, rode on horseback, or arrived at school in wagons, buggies, or sleighs, depending upon the weather. The school building, built in 1898, served the community for school, social, and church events. 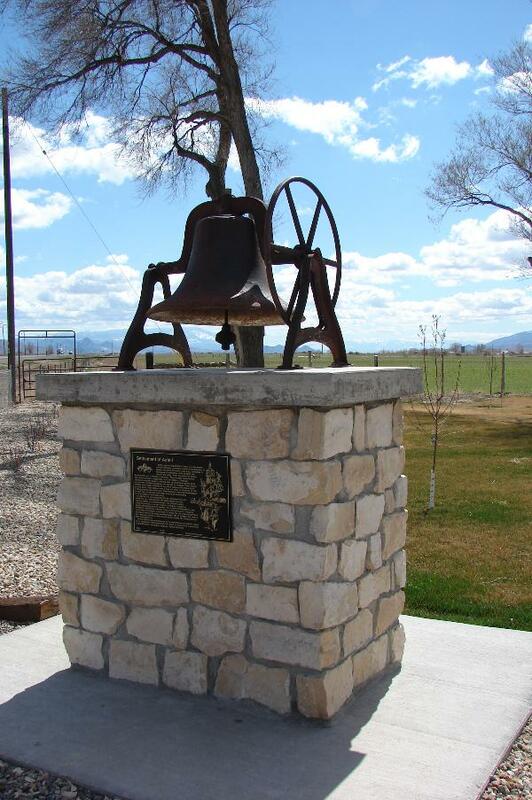 Atop this monument is the original school bell. For years, the bell’s clarion-call tolled for church, school, fire, flood, pending danger, and for funerals. The rock for this monument came from the home of Grover Jensen, the first boy born in Utah after statehood. In 1876 Willow Creek was renamed for Governor Samuel B. Axtell in tribute to his friendliness with members of The Church of Jesus Christ of Latter-day Saints (Mormons) during the trying years before statehood.